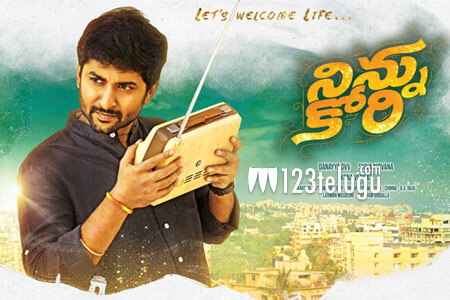 Seattle, WA: Team RedHeartMovies is happy to announce the news about massive overseas release for Nani’s upcoming movie “Ninnu Kori” which is a New Age Entertaining Love Story. Trailer released has got terrific response which exceeded 10+ million digital views in short time and songs are all instant hit especially ‘Adiga Adiga’, ‘Unnatunday Gundey’, ‘Break – Uppu…Break – Upppu’…’King Lanti Uma gaadi’. We are very excited to share the news about releasing Ninnu Kori movie on July 6th around 500 Overseas premiers(350+ shows in USA alone) in many luxury screens from 6PM onwards. Our main intention in playing massive premiers shows is to best accommodate all the movie lovers, Families, Fans starting for Premier day(July 6th). Hope everybody will enjoy this movie to the core and hoping this to be No.1 movie in Nani’s career. Content has already been shipped to all overseas locations and also in few locations online booking has already opened followed by other locations shortly. ALL PREMIERS ON TIME ON JULY 6th FROM 6PM ONWARDS. Nani is on Hit Track as he had made sure to always entertain audience with different story selection and all his recent movies are blockbusters and with back to back hits like Bhale Bhale Mogadivoy, Krishna Gaadi Veera Prema Gaadha, Gentleman, Majnu, Nenu Local. Most of the movie was shot in USA mostly in Bay Area and Los Angeles with a great response from Telugu crowd over there. Adhi Pinishetty will be seen in an interesting role making this movie big as he is exceptionally doing well with his recent hits like Sarrainodu, Marakathamani. Nivetha Thomas our beautiful lead actress has already impressed everybody in her previous movie and now again with Ninnu Kori you all will definitely fall in love with her role. Film is directed by debutant Shiva Nirvana who has directed many hit short films like Love Algebra and produced by DVV Danayya under DVV Entertainments and in association with Kona Film Corporation. Gopi Sunder has composed music for the film, Prawin Pudi and Karthi Ghattamaneni are the editor and cinematographer of this movie respectively. Special Thanks to Danayya Garu & Kona Venkat Garu for giving this opportunity and giving content on time with no hassles for the Overseas Premiers. Also we would like to thank Ramesh garu from Sarigama for planning very big release for Non – USA Overseas . There is a special Promotional offer to get free passes to watch Premiers in USA .We wish public to promote Ninnu Kori movie and get free Premier Passes for helping us in Promoting the movie. Thank You all for the overwhelming response and we wish you all a very Happy July 4th – USA Independence Day and have a wonderful Long weekend with family and friends!! !